When I wrote about this subject four years ago, iDVD did most of the heavy lifting—an app that let you build slideshows, assemble video, and burn a disc. However, Apple’s interest in iDVD fizzled along with its interest in DVDs as a whole—and Blu-ray media never even got a foot in Apple’s door. Unless you already own a copy of iDVD from the purchase of an older Mac or iLife, the only way to get it is by buying a boxed version of iLife from a third-party reseller; Apple doesn’t sell iDVD at all. Fortunately, you have other options. Content is everything. The first step in creating a holiday DVD is the fun part: assembling your content. Start pulling together photos and video snippets from your cameras (whether from stand-alone cameras or camcorders, or mobile devices such as the iPhone or iPod touch) on your Mac. Photo applications such as iPhoto ’11 ($15), Aperture 3 ($80), Adobe Photoshop Lightroom 4 ($149), and Photoshop Elements 11 ($100) import both types of media, giving you a central location for organizing your project’s assets. I suggest making a new album or collection, or a folder in the Finder, to hold the pieces you want to use. Before you start, take a moment to think about the project’s structure and how your viewers will interact with it. Will they watch just one movie? If so, you probably want to build that in a video editor such as iMovie ’11 ($15) or Premiere Elements 11 ($100), which gives you a lot of control over the movie’s presentation. 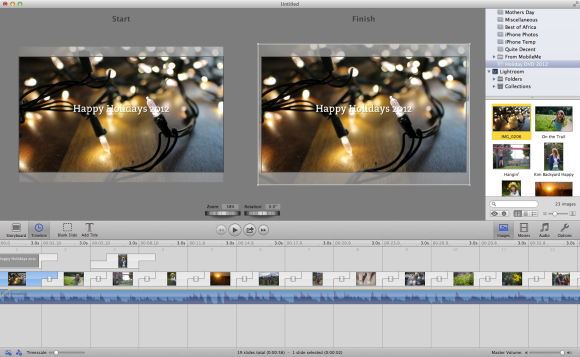 An iPhoto Slideshow project offers settings for controlling the show’s appearance. However, there’s another way to present photos on a DVD. Instead of creating a movie, iDVD and Roxio’s Toast Titanium 11 ($75) can build a slideshow on the fly; viewers can then manually move between images via a DVD player’s remote, or they can let the show play on its own. 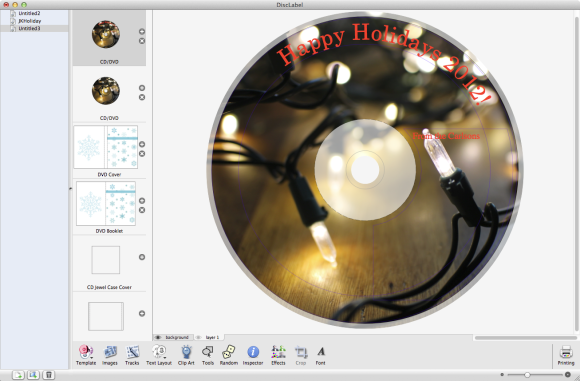 You don’t get the same number of options for transitions, background music, and animations, but both applications make it easy to automatically include the original photo files on the disc in case someone wants to copy them to their own computer. FotoMagico was designed from the start as a slideshow creator. Premiere Elements can burn a DVD project on its own. iDVD offers extensive ways to customize the look of the menu screens that your viewers will see, including dozens of pre-made themes and the ability to use media elements in animated “drop zones.” Toast is much more conservative about appearance, though you can change the background image easily. At this point, you’d normally click a Burn button, insert a blank DVD, and wait for the data to be encoded and written to the disc. DVDs employ a specific folder structure and specific video encoding settings, so you can’t just burn the media onto a disc in the Finder. But that brings us back to Apple’s abandonment of optical discs: Your Mac may not include a DVD burner at all. You can also take the project to another computer that does have an optical drive. For example, I have an older Mac mini that acts as a media server in my house, but you could also use a friend’s computer. For personalizing the appearance of your project, iDVD can’t be beat. Instead of burning the data to a disc, you can save it as a disc image. You end up with a single file (which may be quite large, depending on how much content you included) that you can transfer over your network or via a USB drive or portable hard drive. Copy that file to the other computer and use Apple’s Disk Utility or Toast (if it’s installed) to burn the contents to a disc. Pack and ship. The disc is done, but unless you want your home to become a mini Blockbuster, it’s time to label and mail the discs. Sure, you can scribble the title on each disc (using a marker that’s designed for writing on optical media), but it doesn’t make for a polished gift. I recommend Smile’s DiscLabel 6 ($36) for designing custom labels, with your own artwork and typography, that you can print onto peel-off templates and affix to the discs. DiscLabel includes plenty of templates, but you can use your own images, too. And once all the discs are assembled, don’t forget to mail them in time! 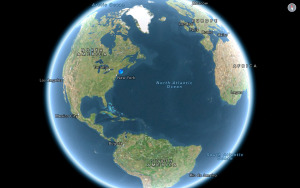 You can print addresses onto sheets of labels using OS X’s built-in Contacts app (the app formerly known as Address Book), but a better option is BeLight Software’s Labels & Addresses ($50), which offers templates as well as more options for organizing and customizing the labels’ appearance. Remember that a disc is likely to cost more in postage than a typical envelope, so it’s worth weighing one and looking up the price or taking the discs to your local post office for mailing to ensure that they aren't returned to sender.